Here at Designthusiasm, my approach to Halloween is much the same as my approach to all design projects. I begin, unwaveringly, from the foundation of my design aesthetic and apply it to each new project. 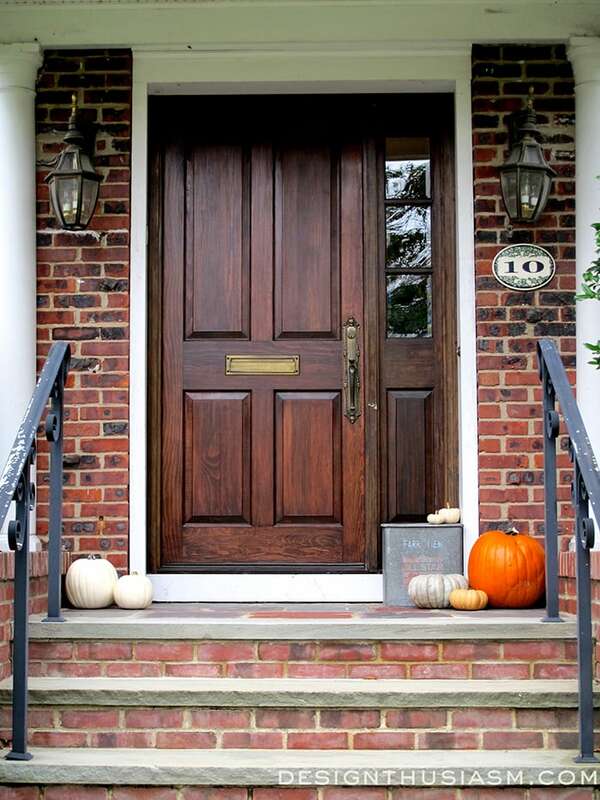 Hence, I give you Halloween, Designthusiasm style… My front entry is quite simple. 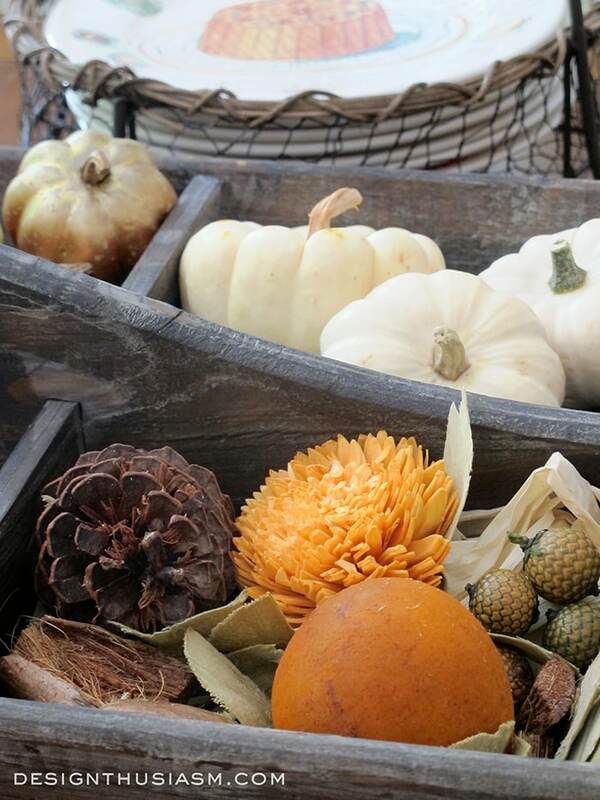 A smattering of varied colored pumpkins encircle my vintage milk box. 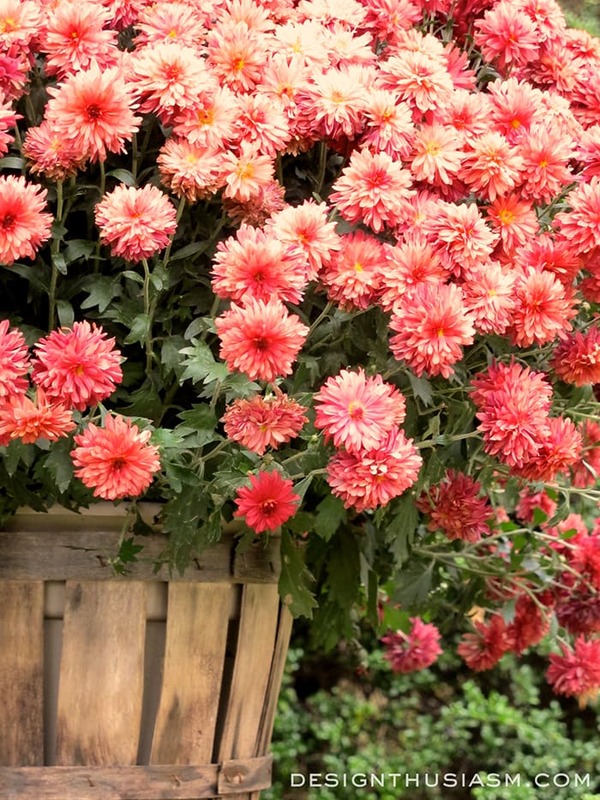 The brick pillars flank the stairs with huge mums found at a roadside farm stand. I generally keep my candy basket inside the front door, so I can greet trick-or-treaters as they arrive, but I leave room outside the entry so the little ones don’t have much clutter to navigate as they arrive. Here’s a little peak inside my entry, but I will delve further in a later post. I love the shadows the afternoon light casts, bringing out the interest in the creamy white pumpkins and the warmth of the autumn potpourri. Let’s move into the living room for the heart of the tour. The essence of my Halloween look revolves around color. The black and orange pairing is so emblematic of the day, that one hardly needs much else in the way of imagery to broadcast Halloween. Once grounded in color, I decorate into that story with the accessories and styling I always love. 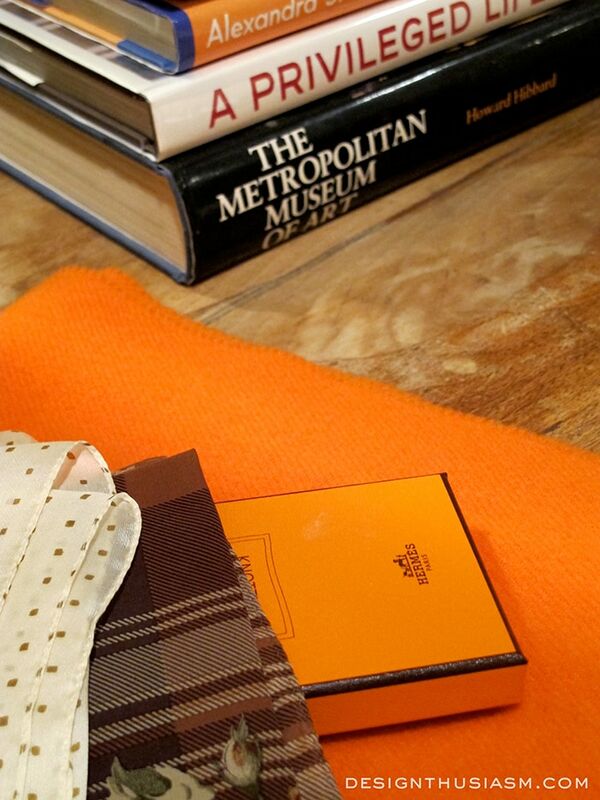 For this vignette, I began with a coffee table book stack to embody my color concept. 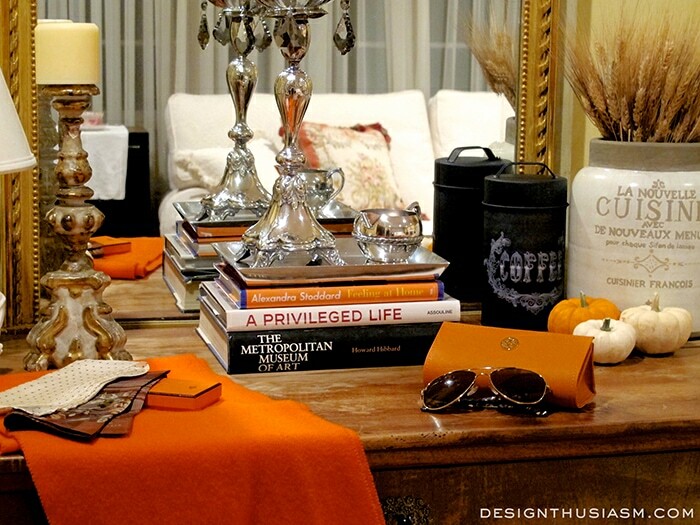 Scattered pumpkins always fit the Halloween mood, while silver tabletop accessories add a little pedigree. The vintage french chair is one of the treasures that came to me from my grandmother. 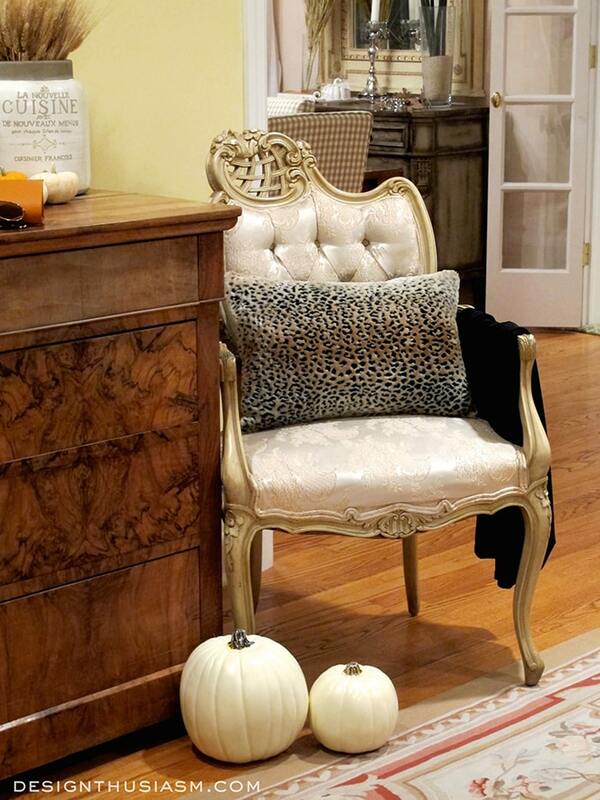 I like the touch of edginess that the cheetah pillows add and when paired with the pumpkins, they feel very Halloween to me. 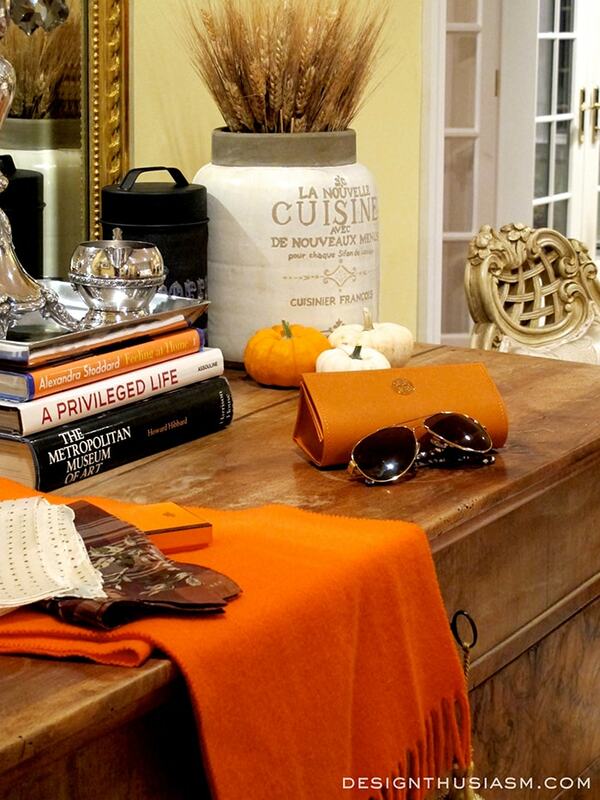 The selection of fall scarves sit comfortably at the ready, as this chest is located next to our entry foyer. 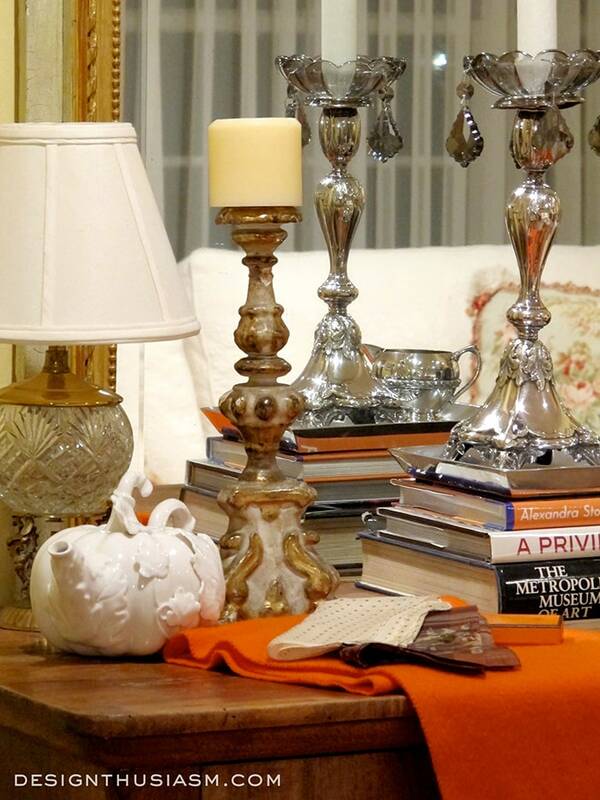 My antique candlesticks make an appearance in many of my decor posts. The silver one is a vintage piece found in Alfie’s market in London. The gilded wood piece is the oldest item I own, found on a recent trip to Florence and said to be a Renaissance church candle holder from the 1600’s. 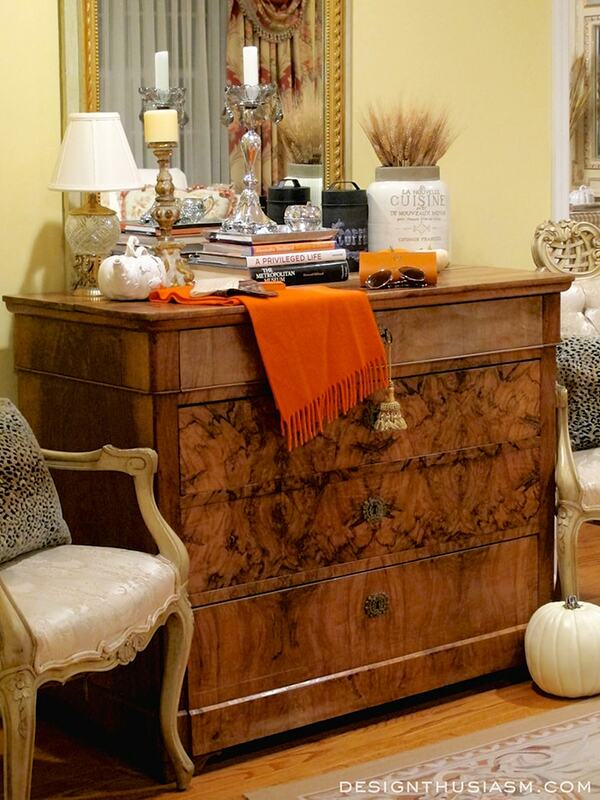 The burled wood chest is another antique piece, purchased in upstate New York. I love that it offers storage, a commodity you can never have enough of. 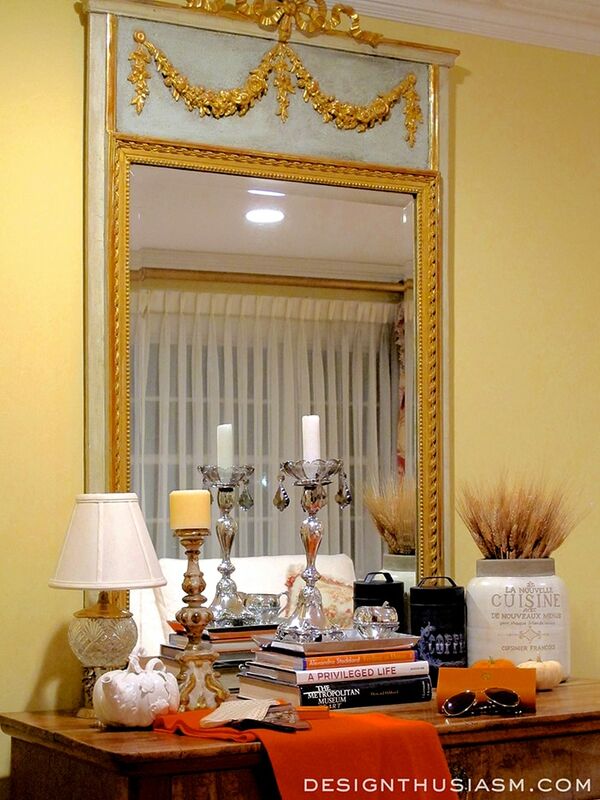 Another very old piece, the French trumeau mirror is one of my very favorite items in my home. I have lovely crystal sconces purchased in Sorrento, waiting to be hung flanking the mirror. They’re sitting on a piece of furniture nearby, where they’ve waited patiently for two years. Better get on that… lol. In the same room is our fireplace mantel that was featured in a recent post. 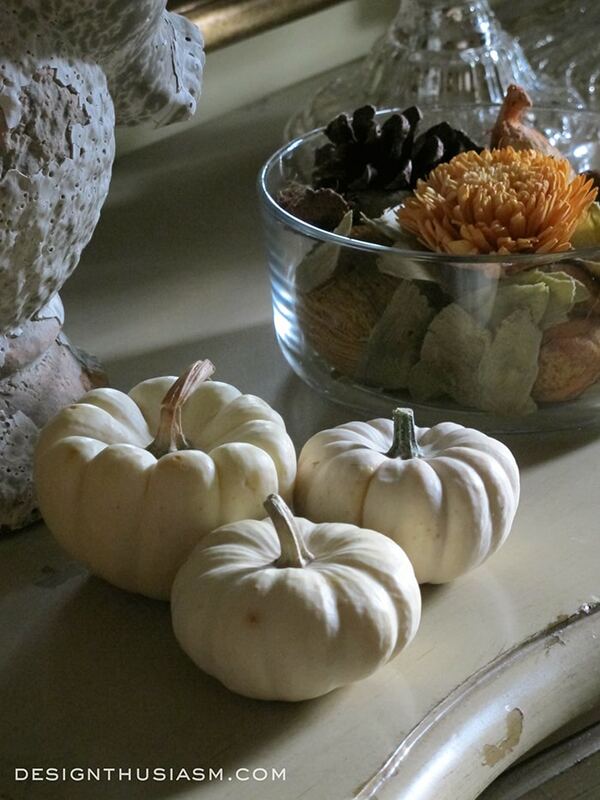 I’ll show a glimpse or two below of our fall decor, but you can click HERE to see more about the mantel. 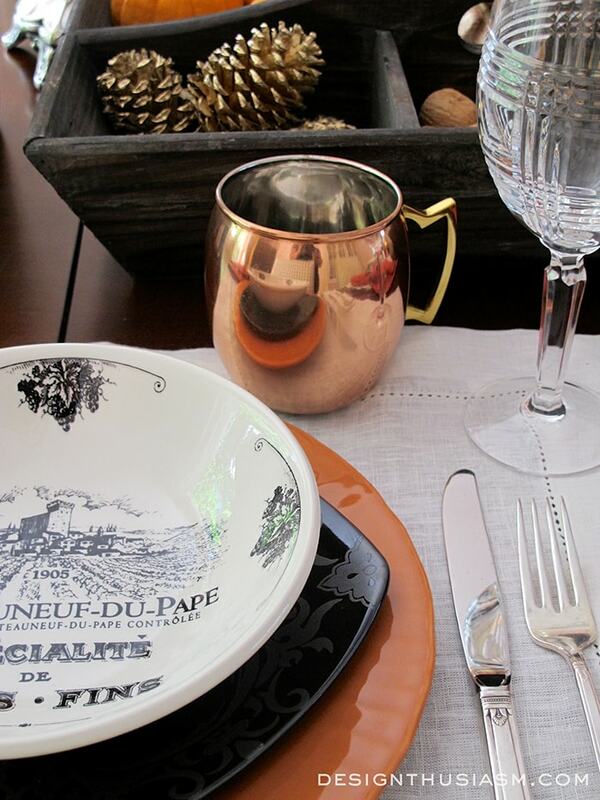 Moving into the dining room, you can see my French Country Halloween Table setting. It was featured in more detail HERE, but I’ll show some highlights on this tour. 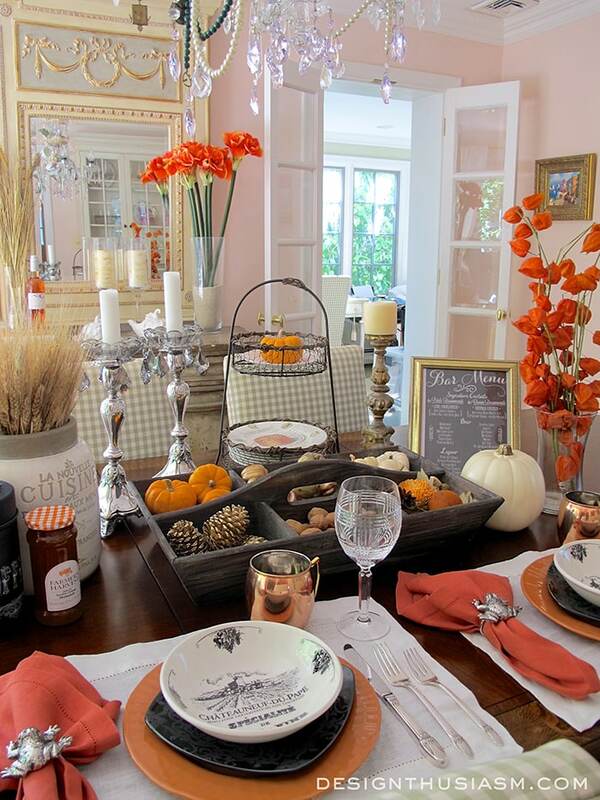 Again, the basis for the look is the traditional Halloween coloring, but the setting is infused with classic Country French touches, like the French wine label bowls. 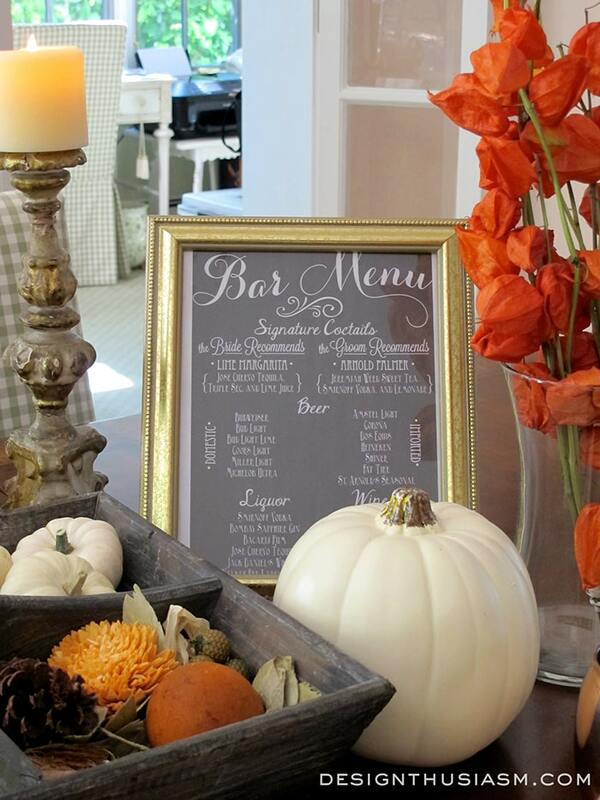 The bar menu is reminiscent of a bistro chalkboard menu. Black and orange pulls the setting together for Halloween, but delicate accessories like washed linens and farmhouse hints lighten the mood. 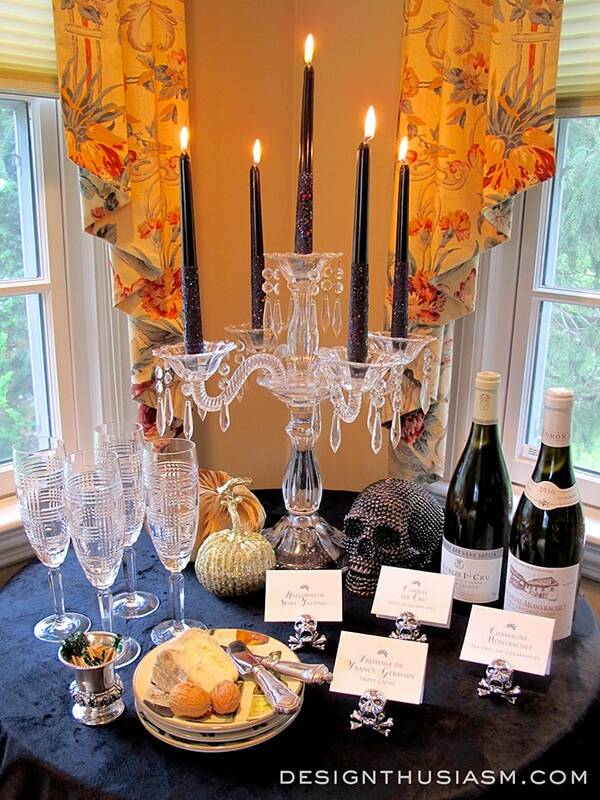 For a bit more elegance, we can look to the den, where I set a corner table for a posh Halloween wine tasting. More photos and details can be found HERE, but I’ll show a peek below. This time I’ve swapped out the orange and black color pairing and introduced skulls to work the Halloween theme. 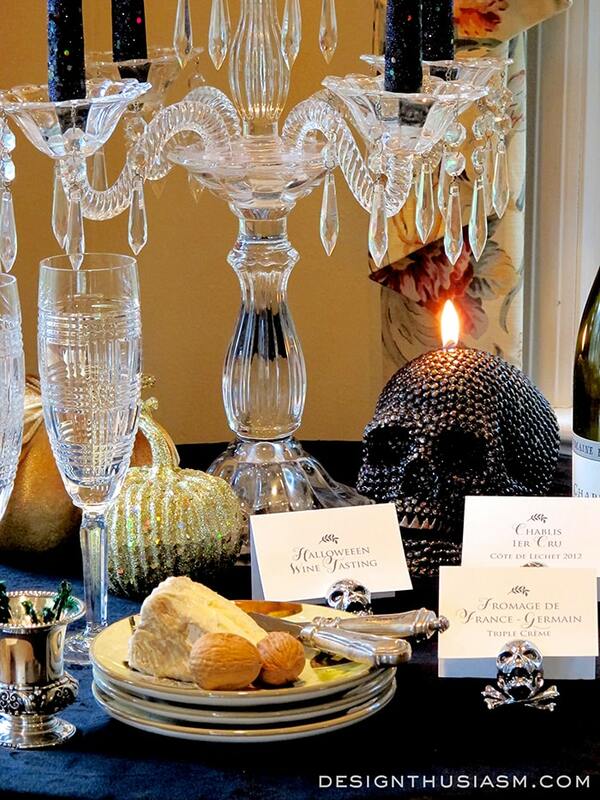 The beaded skull candle and the silver skull placard holders add glimmer and elegance, yet a spooky note. DIY placards identify the wines and cheese. I used a mix of fonts and subtle branch imagery and printed them right on my home printer. I’ll be posting more of my fall decor in the coming weeks and I look forward to sharing some of the other corners of my home with you. If you’d like to ensure not missing any posts, please subscribe in the box at the top of the page. You might also like to follow my Pinterest page by clicking HERE. Thank you for visiting my Halloween home! I hope it inspired you to approach Halloween from your own unique standpoint. Please take the time to visit the other wonderful tours, listed below. Linking with Metamorphosis Monday, YourDesignsThisTime, The Scoop, Inspire Me Tuesday, Twirl and Take a Bow, Wow Us Wednesdays, Tablescape Thursday, From My Front Porch to Yours, Home and Garden Thursday, Feathered Nest Friday, Show and Tell Friday, Silver Pennies Sundays, Knick of Time. Thanks Gretchen!! I’m excited to visit the other tours too… 🙂 You’re way ahead of me… lol! Beautiful and classy. I love your simply decorated front door and porch. When I drive around my neighborhood I see so many tacky decorations, ugly inflatables and giant spiderwebs. I wish your home was one I drove by! 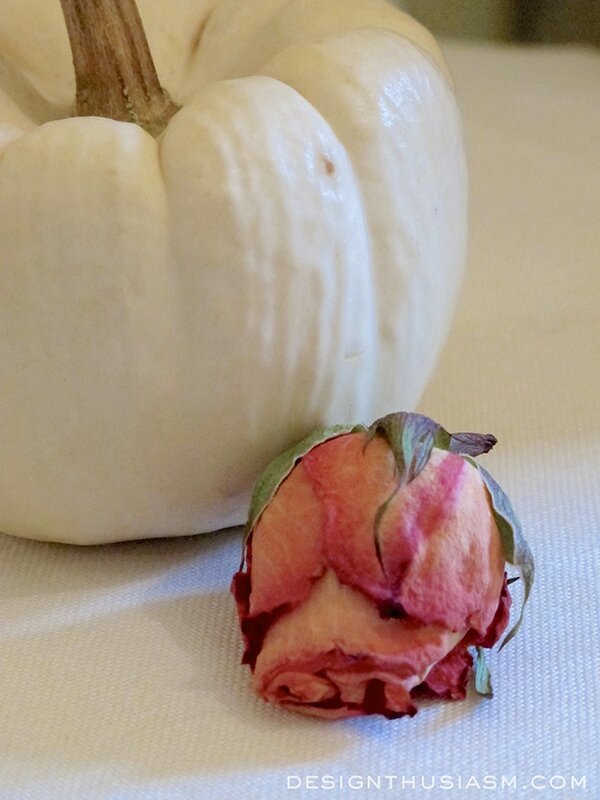 Lovely touches of Halloween throughout your home without over-dong anything! 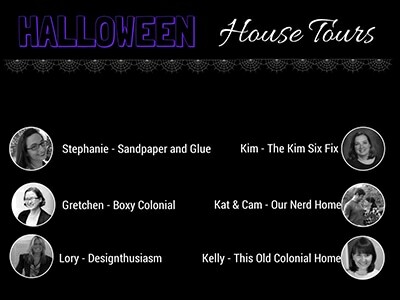 Fingers crossed by next Halloween I will be out of a condominium and into a house! Look me up! When I get there, I would love to participate in a house tour! Thanks for opening your home to share with all of us. You got a deal! Thanks for all your kind words!! 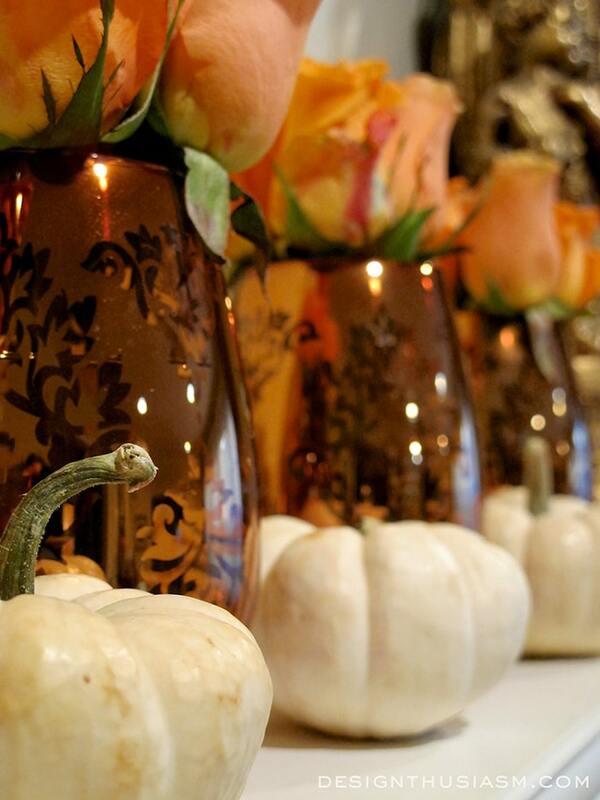 Love your elegant touches of fall and Halloween everywhere! So aesthetically perfect! I like how you simply (although it doesn’t come so simply to everyone!) build upon the classic decor that already exists. It’s like spraying perfume in the air and walking through it instead of applying it directly to the skin…you get the wonderful essence without overwhelming people! This is GORGEOUS. 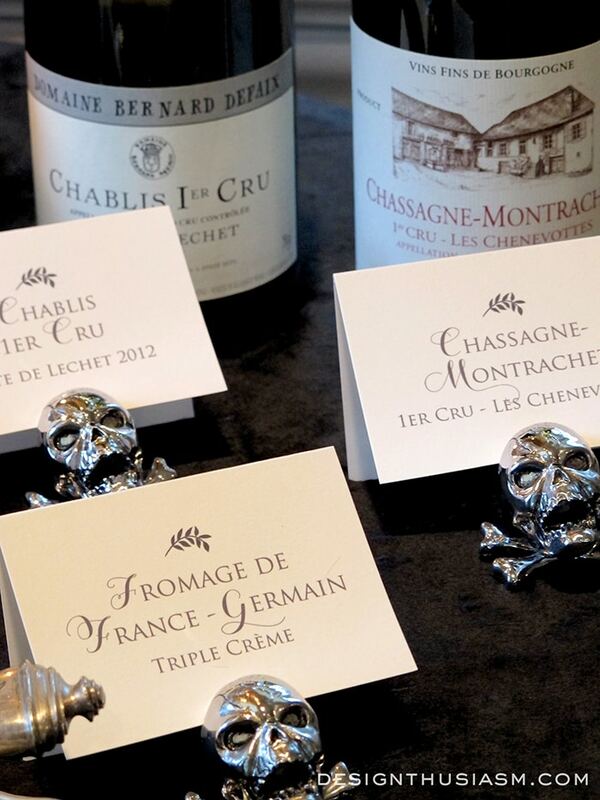 Love how you worked the skulls and other subtle Halloween touches into a completely elegant design. 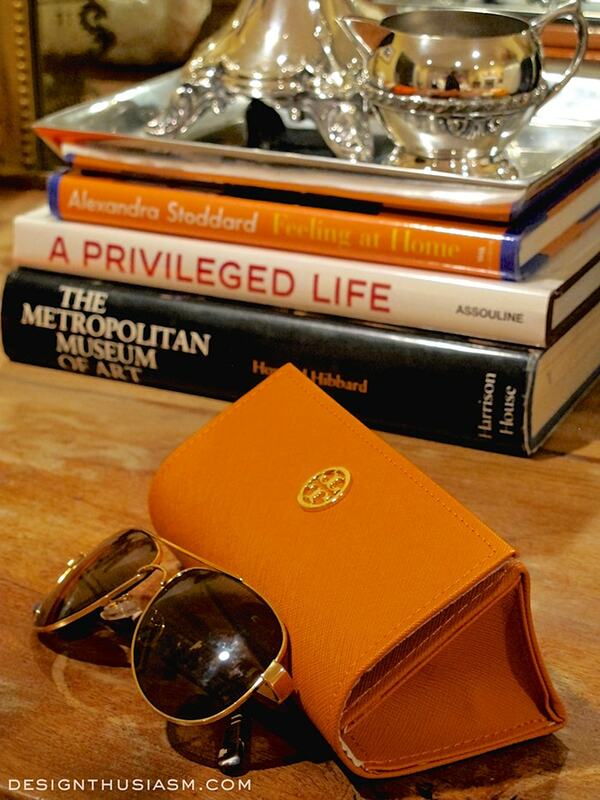 There’s so much to love in these images: The Ralph Lauren glasses, the frog napkin rings (why, oh, why, did I pass them up??? 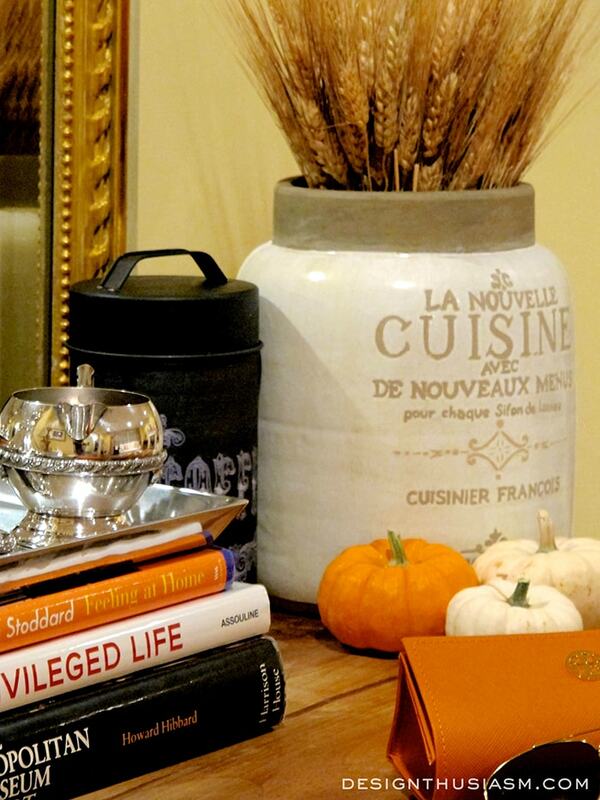 ), the white pumpkin teapot, the artful arrangements with just the right touch of orange . . . I love this post! What a lovely comment! Thank you so much, Maria!! Your house is always so gorgeous Lori! And once again, you hit it out of the park! I’m so proud to be on tour with you! Kim, that’s such a nice thing to say!! I was actually really proud to be on the tour with you, because you really know what you’re doing… 🙂 Btw, can you do me a favor – I just installed ReplyMe for comments, but have no idea if it’s working. Can you just let me know if you were notified of my reply via an email? Thanks!! 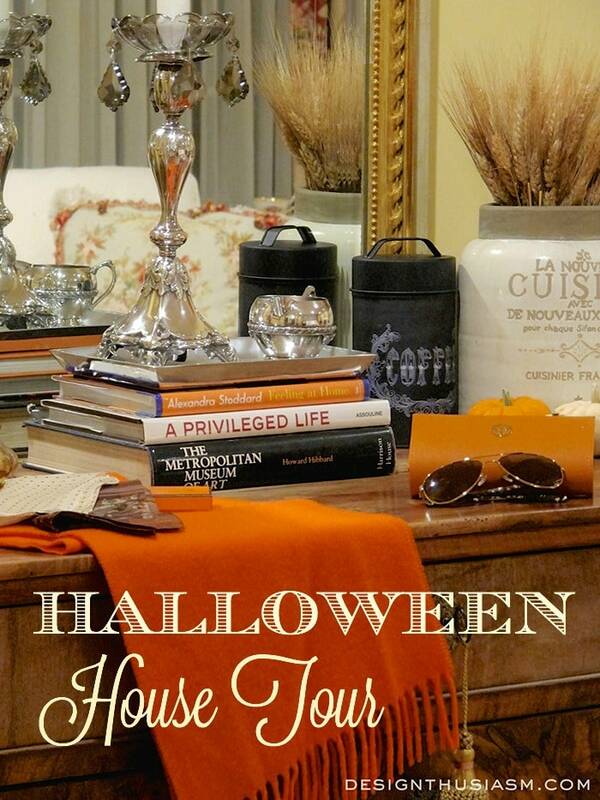 All your halloween touches are beautifully styled… but when I saw that little Hermes box peeking out I knew you were brilliant! Ha ha, great comment! 🙂 Thanks for visiting! 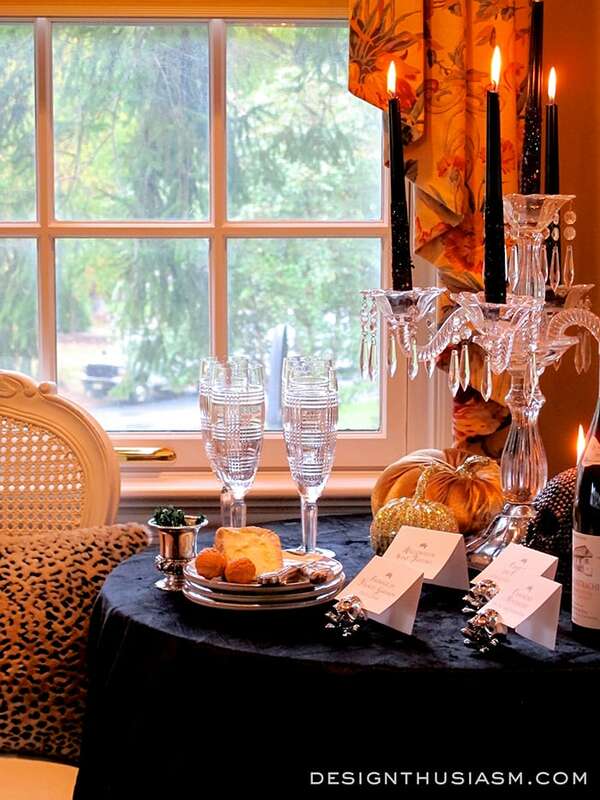 Halloween has never looked so elegant! I love all of the personal touches and you have such terrific treasures. Thank you Sharon, and thanks for stopping by!! It all looks so great! You are ready for fall! Having just got back from France last week, I appreciated the french touch. Very Pretty! Ah, lucky you Toni! One of my favorite places… 🙂 Thanks for stopping by! Beautiful & Elegant! Love the Style & Warm, Rich Colors used. Your pics are wonderful too! It all looks AMAZING Lory!!! Your mantel is just beautiful and that table is SO gorgeous!!! Beautiful! 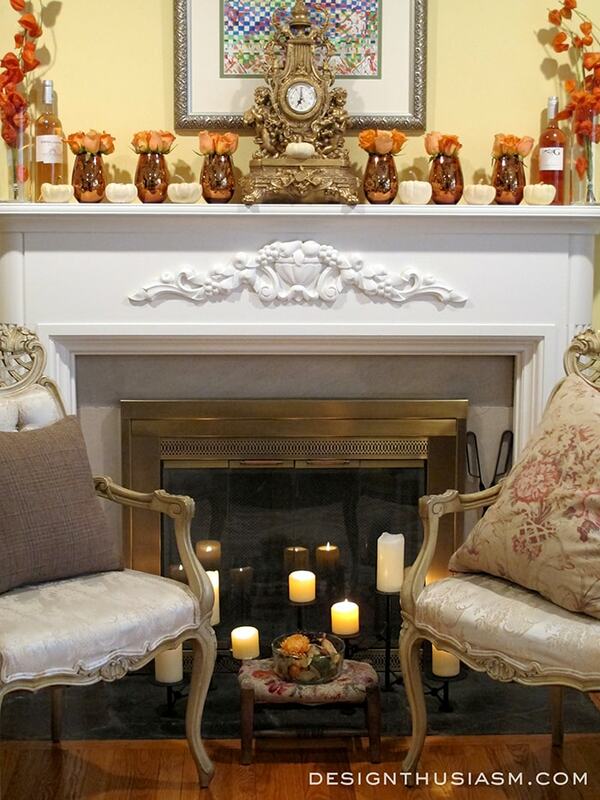 I love all the white pumpkins, and those vases on your mantel are to die for! Great house! Enjoyed seeing it. Great tour Lory. I especially love the wood caddy centerpiece on your table. Love this! Your home is so beautiful, I adore your antique pieces. I love mixing in the old with the new, as you’ve done. 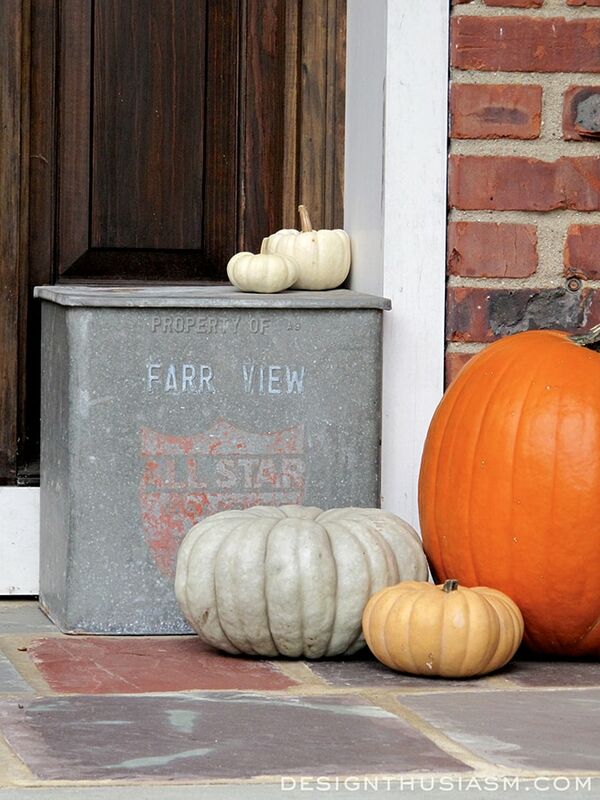 Great seasonal decor, thanks for sharing. Elegant and warm. Very inviting! I found the tiny champagne bucket toothpick holder adorable. May I know from where it was acquired? Your front door is magnificent. The color is beautiful. Thanks for sharing.